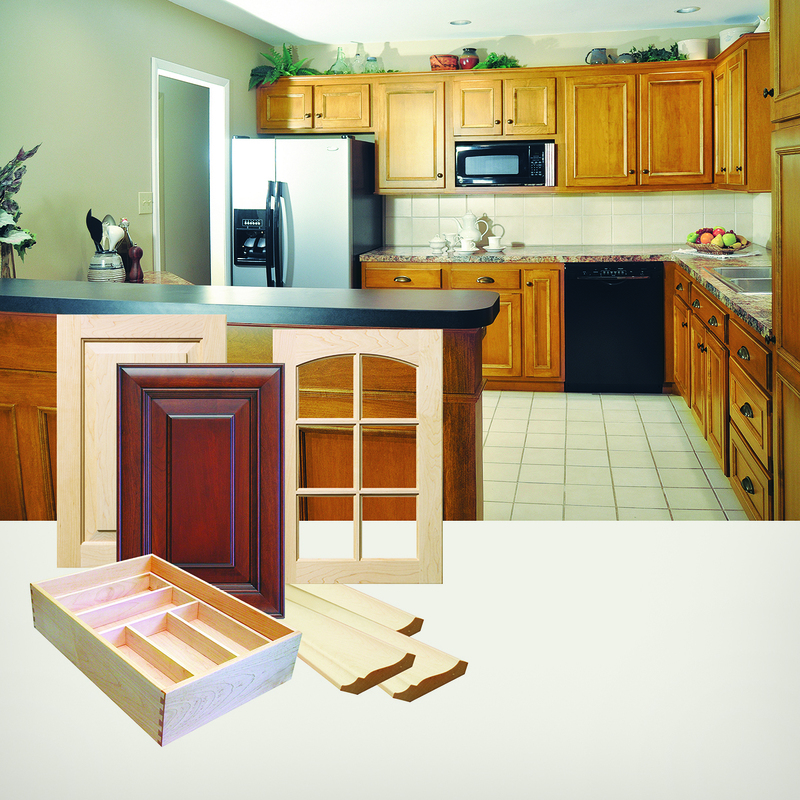 Keystone Wood Specialties cabinet refacing offers services for a wide variety of custom doors, drawer fronts, dovetailed drawer boxes, molding, and veneer. With Keystone’s superior machinery and know-how, the company has the capacity to not only tackle most manufacturing requests but to do it quickly to exact specifications. 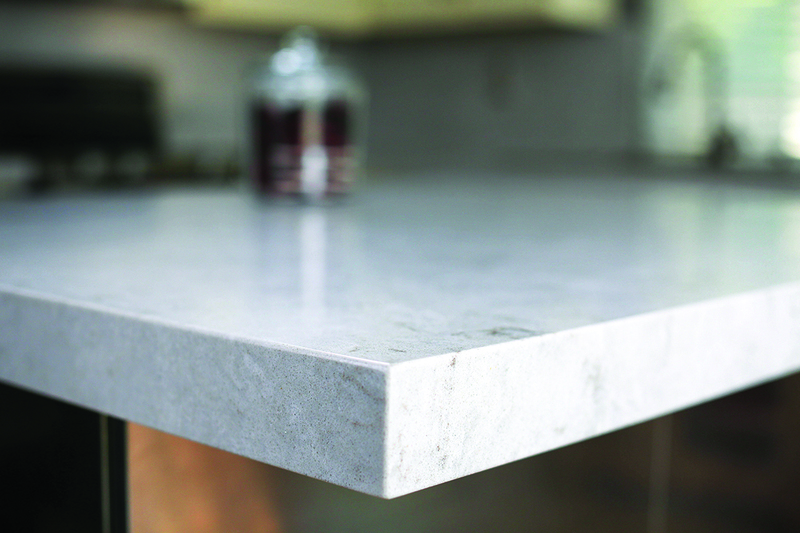 Caesarstone, an engineered quartz material requiring no sealants, comes in a wide range of colors, including the marble-inspired Super-natural collection, which retains the luxurious look and cool, tactile qualities of natural stone while offering the durability and ease of Caesarstone surfacing (White Attica, new for 2017, shown). 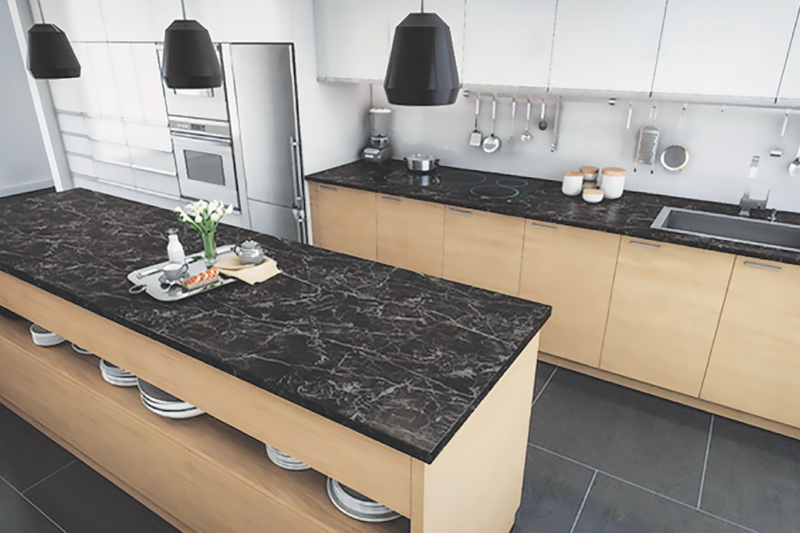 Resistant to scratches, cracks, stains, heat, mold, and mildew, Caesarstone has four times the flexural strength and double the impact resistance of granite, the manufacturer says. It comes with a lifetime warranty. Wellborn Cabinet's Touch to Open technology has smart design, convenience, and accessibility in mind. Whether wanting the cabinet to open or close, or to activate its interior lighting, users simply touch the front of the door or drawer that they want to access and a small motor activates the door or drawer to open or shut, eliminating the need to grab any hardware. 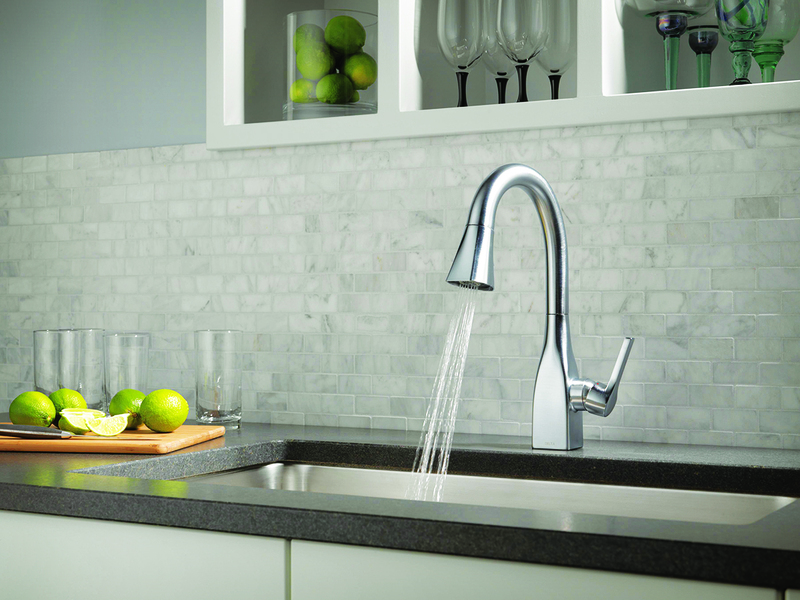 a user’s movements: a wave of the hand—or an object such as a pan or utensil—turns the faucet on or off and is precision-designed to provide reliable operation without false activations. Sweep spray creates a wide, forceful blade of water for effective cleaning, and the DockNetik docking system secures the pull-down sprayhead to the spout using magnetic force. 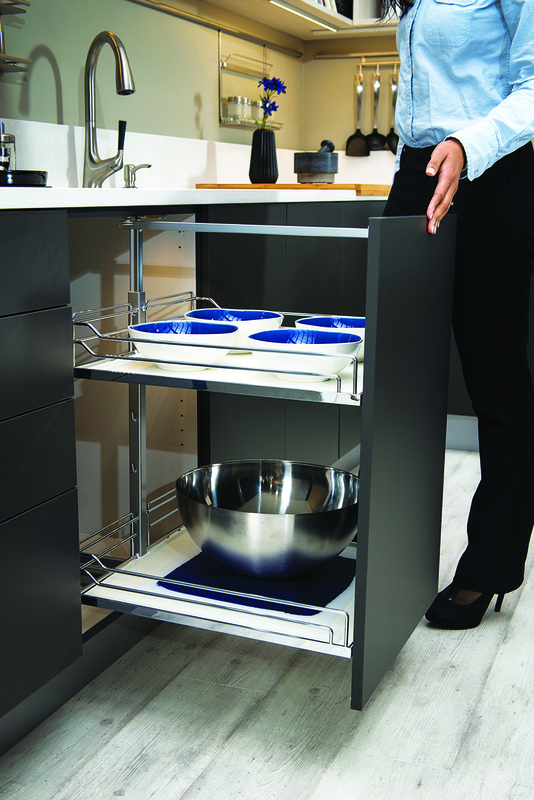 Rev-A-Shelf produces innovative cabinet internals to maximize space and organization. Among its most celebrated designs are its blind-corner hardware, which comes in two versions: the Cloud, a swing-out design, formerly known as a Half- or Banana-Susan, and the Wire Pull-Slide-Pull, which features a tandem arrangement that slides in two directions. Hardware can be installed for either left- or right-handed applications and is constructed of heavy-duty materials, making it functional, reliable, and stylish. lets users simultaneously cook multiple dishes or combine elements for larger pots or griddle use, and even heat eliminates hot spots, consistently delivering evenly cooked food. 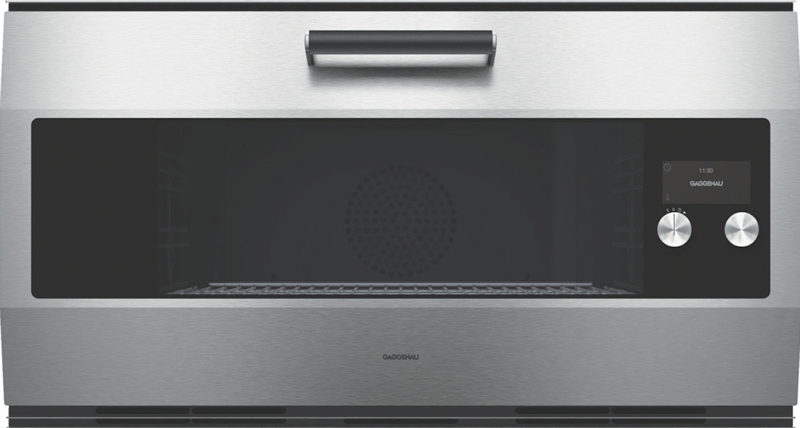 Gaggenau’s EB 333 oven measures 36 inches wide and nearly 19 inches tall and boasts a stainless steel finish with a sleek TFT (thin-film-transistor) touch display for precise heat management. The oven door, with its signature raised window, is made from a single piece of 3 mm stainless steel that’s substantial but easy to open and close due to a soft self-close mechanism. 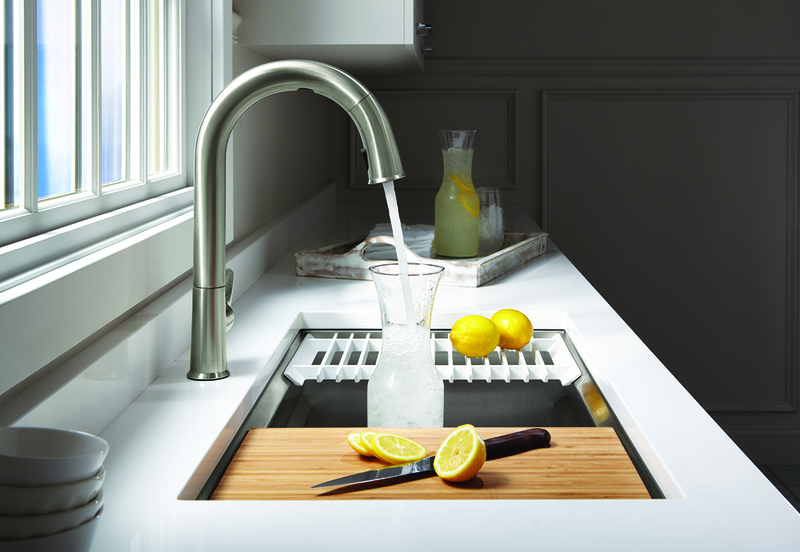 The Mateo Kitchen Collection’s sleek, high-arc pull-down design is coupled with modern innovations, such as MagnaTite Docking to firmly hold the spray head in place via a powerful magnet and Diamond Seal Technology to ensure “like new” operation for the life of the faucet. 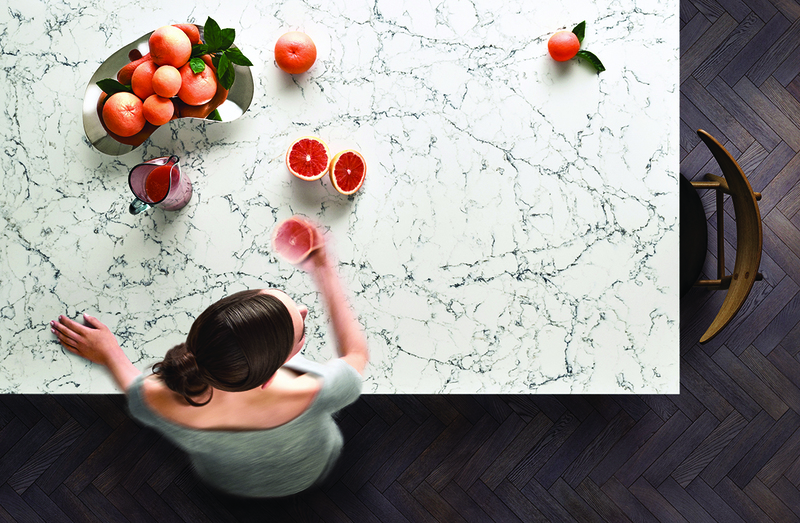 Transform is Caesarstone’s 13 mm quartz overlay surface solution. Because it’s applied over existing countertops, including tile, laminate, stainless steel, granite, concrete, and butcher block, there’s no need for tear-out, saving time and money. Transform is low maintenance, scratch, stain, heat, and crack resistant and is covered by a lifetime warranty. Arborite’s Maison Collection is a family of products for the kitchen offering the look of natural stone with the convenience, sustainability, affordability, and ease of maintenance of high-pressure laminate. Panorama and Welcome Home were the first two series to launch. Panorama replicates the look of authentic stone in laminate based on full-scale scans of real stone slabs, such as travertine and marble (Saint Laurent Marble, shown), while Welcome Home’s neutral palette emulates small-scale stone looks, such as granite and quartz. 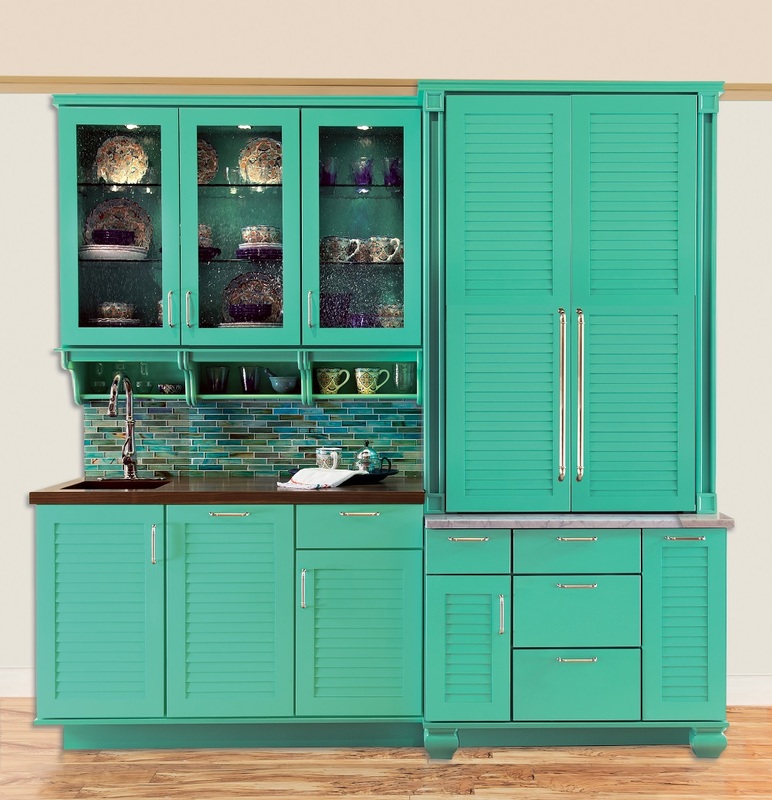 Wellborn Cabinet's Color Inspire offers an almost limitless selection of hues from the extensive paint programs of Sherwin-Williams, Benjamin Moore, and Valspar. Color Inspire is available on Wellborn’s maple and MDF door styles in its Premier, Elegant Bath, and Estate series. 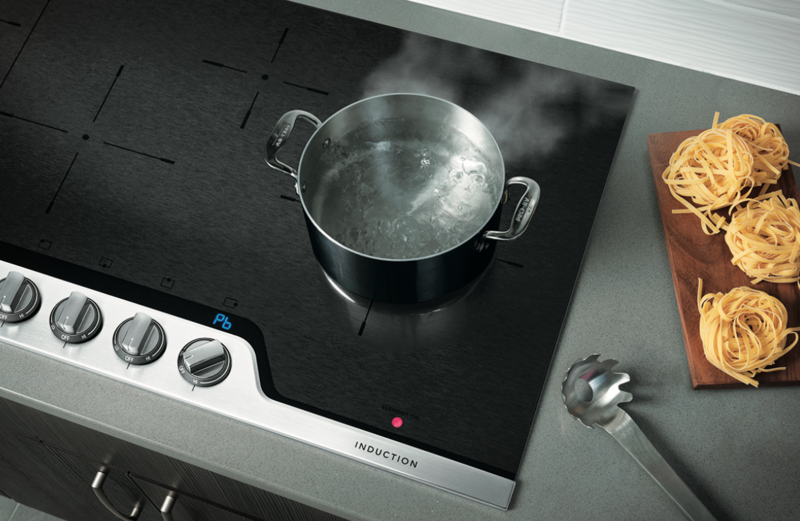 With 11 oval conductors and three cooking zones, the Liberty Induction Cooktop from Thermador offers cooking space and flexibility. 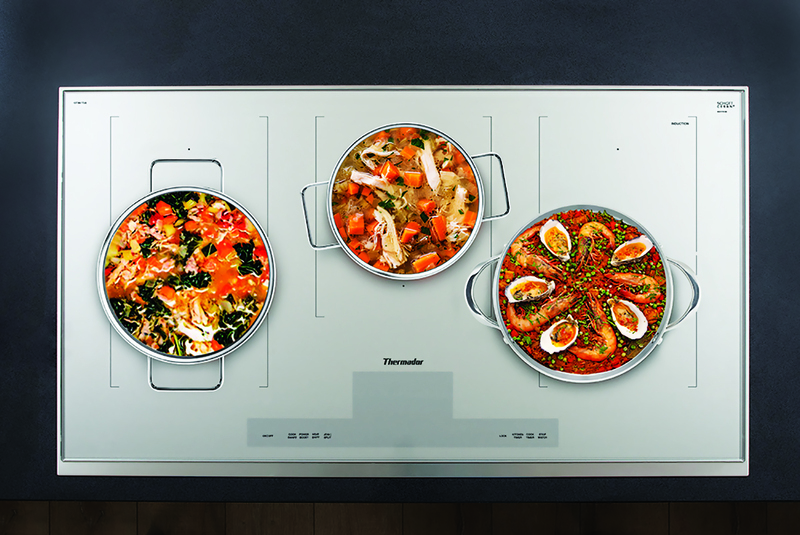 The cooking zones accommodate pots and pans from 3 to 9 inches in diameter; a HeatShift function adjusts power levels when pots and pans are moved across its surface; MoveMode automatically transfers cooking settings when cookware is moved to a new location; and CookSmart sensors automatically control the temperature when pan frying.